Good gravy, so many new changes coming with the alpha notes! Instead of going through all of them, I’m just going to summarize my favourites. You can turn to BlizzPro later in the week for a more in-depth analysis. Don’t tell me you didn’t see this coming. For almost the entire expansion, Discipline Priests were considered top tier and a virtual must have in progression focused guilds. It wasn’t so much the temporarily healing buff from Evangelism, but the Archangel ratios which made us a force to be reckoned. Let’s deal damage with any of our main DPS nukes. On top of that, a portion of the damage done is going to also heal. Oh and it’s a smart heal! In a way, I’m disappointed that it’s lowered but I can’t help but think it’ll help equalize the state of healing classes a little more. At the very least, maybe it’ll lower Discipline representation some and allow us Holy Priest guys back into the fray as a better alternative. There was nothing really wrong with Holy (well, there was but we’ll cover that in a moment), but Holy just wasn’t quite as well sought after. Remember when Chakra came into play? It was almost two expansions ago during the start of Cataclysm. It essentially functioned as a stance for Holy Priests. Certain spells would become stronger depending on which Chakra you had active and you’d gain access to a Holy Word spell that corresponded with that stance. It was intended to provide flexibility and allow Priests to select the role they were going to perform in a raid: Single target healing or multi-target healing. If you were in a Chakra stance and wanted to do something outside of the benefit, your spells wouldn’t make quite as an impact. The alpha notes said it quite clearly: The buff from being in a certain Chakra “felt like a penalty for being in the wrong Chakra, rather than a bonus for being in the right Chakra”. Chakra: Sanctuary provided a strong buff to Prayer of Healing which was great when I was covering groups but it was lousy if I needed to spot heal the tank for a few moments. Lowering the bonuses attained in Serenity and Sanctuary are a start. Saying “I’m only losing 10% of a healing boost instead of a 25% bonus” is much more reassuring. Instead, Holy Word: Serenity and Sanctuary are receiving more of a healing bonus. I suspect our normal baseline spells will be adjusted and balanced accordingly. How else am I supposed to get my mana back? One of our healing utilities is out the window as a victim of Blizzard’s crackdown on ability bloat. Now they’ve promised that mana regeneration rates and spirit will be monitored to offset the loss of Hymn of Hope. Now I’m really at the mercy of my own healing spells. I can’t heal full throttle and rely on Mana Hymn to provide me with a cushion anymore. I’m going to miss it. To be more specific, I’m giddy with Glyph of Restored Faith. It can be used as an escape or a closer or if I just want to get next to someone. Maybe it isn’t that killer, but I really do like the fun I can get with this. I can pull myself out of harms way if I’m caught standing in a fire! It’s like a pseudo defensive cooldown! You can find the new talents at the recently updated WoW Head calculator. I liked that old talent with Void Shift where you could use it as many times as you wanted but I guess that one was tossed. Now there’s healing talents when you reach level 100 like Words of Mending. Every healing or absorb spell generates a stack of Word of Mending. Hit 5 stacks, cast a free Prayer of Mending! Worried about Prayer of Mending overriding itself? A minor change was introduced where Prayer of Mending from multiple Priests are able to be applied on the same target. Not only that, one Priest can have multiple applications of Prayer of Mending on more than one target! I mean, yo dawg! I heard you like Prayer of Mending! So I put a Words of Mending on your Prayer of Mending so you can Prayer of Mending while you Prayer of Mending! Holy Priests gain access to another talent called Clarity of Purpose. It replaces Prayer of Healing with a new spell called Clarity of Purpose. We know that smart healing spells are getting dumber. But if healing spells were given an IQ, I’m certain Clarity of Purpose would take home the smartest heal ever award. It’ll heal players within 10 yards of your target. Not only that, it splits the heal so that weaker players receive more of the healing pie. This is going to be a fun beta testing period. Warlords needs to come soon! I’ll do my best to keep track of any pertinent Priest changes and updates as we progress through the development stages of the expansion. Matticus is the founder of World of Matticus and Plus Heal. 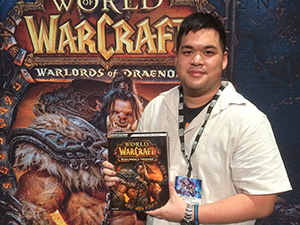 Read more of his columns at WoW Insider. League of Legends player. Caffeine enthusiast. My Atonement-focused priest runs with a lot of Spirit (I like having mana available when things get interesting and I’m not generally healing progression content these days)… spirit>int>crit>>>haste>mast gemming/reforging priority, basically. If all that spirit on gear is converted to multi-strike, or haste, or crit… that’s going to be a LOT more throughput than I’m getting now. Enough to make up for a 25% throughput loss? Maybe not, but I wouldn’t be surprised if 40% of my secondary stat budget across all items is spirit right now (I’m not on my PC to confirm but most of my gear has spirit and what doesn’t has had some reforged on it, plus many gems). I wouldn’t be surprised if 40% more secondary stats translates to pretty close to 25% more throughput. It’ll also make for a nice increase in dps, too. Of course, they might not be done with the nerfs yet. 🙂 Wonder if they’d consider converting Archangel to a dps boost vs a healing boost, so that Atonement dps abilities get converted into additional healing but traditional healing spells aren’t included, cutting back on the “Atonement just to get Archangel” synergy in a similar way to how they’re splitting up Mistweaving and Fistweaving for monks. Regarding the loss of Hymn, I think it was cut more for the raid regen ability than the personal one, I’d expect to be compensated. If anything, I’m more concerned about the loss of mana regen from Shadowfiend… if Hymn was your go-to regen ability, Shadowfiend was mine. Also, random complaint, I hate those stupid short-range AoE healing spells almost as much as I hate party-based ones… I’d like fewer (zero) of those vs more. My ability to heal should rely as little as possible on my fellow raiders being able and willing to do things like stack up, especially when many fights require them to be spread out and I’m staring at raid frames vs being able to see who’s standing roughly in the centre of the pack. Finally, regarding Words of Mending, think there’s any chance of that talent removing PoM as a castable ability, making it a passive-only bonus? Strikes me that quite often the guy getting the healing is also the guy having PoM manually put on him and while PoM from multiple priests will be able to stack, I don’t think that extends to multiple PoMs from the same priest.